What growing up in my family business taught me that no MBA ever could. The most valuable business lessons I’ve ever learned didn’t come from college or an online course. 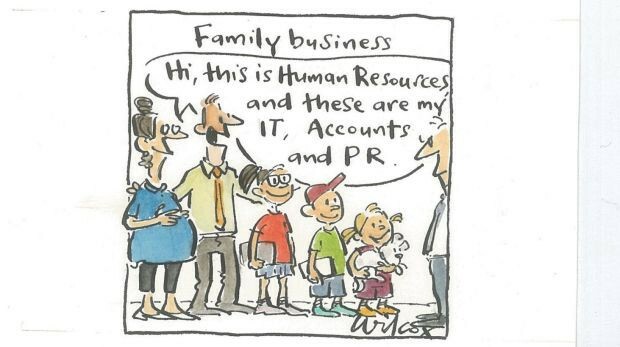 They came from working in the family business. My parents started the business when I was 6 years old. As soon as my little hands and attention span were capable I was tasked with helping with mailings—something now heard much in today’s marketing world. Back then, we collated, stuffed, labeled and stamped our mailers, then we sorted them by zip code and carted them to the post office. I remember working on mailings at the kitchen table, and when we got a new kitchen table, my dad told me that I had helped pay for it. I was positively aglow. My older siblings could do many other tasks that I could not, but I had helped pay for the new table! 1. Every single person involved in your business is important, valuable and capable. No matter how many people work with and for you, each one is an individual asset. All relationships should be reciprocal. Everyone should be treated with respect. We had the greatest warehouse guy ever. He was “the warehouse guy” until the business grew and he became the “Warehouse Manager.” He took so much pride in packing each box you would have thought he had personally hand-made each item packed. When I did my time in the warehouse, he showed me how to do this crunch/fold/tuck thing with the packing paper so nothing would get bent. My dad told him that he was the final say, the final touch to what our customers would get and that he was one of the most important people in the chain that linked manufacture to end user. Our warehouse guy took such good care that people at trade shows asked us about him. My dad had let him know how important his role was, he acted accordingly and the customers loved him! He worked with my parents company until they retired. So, check yourself on this: Do you treat everyone you work with in a way that lets them know they are important? Do you thank them and encourage them? Do you teach them and learn from them? Do you listen to them and talk with them? If you do, you’ll build a work family that cares as much as you do, sticks with you and grows with you, until you all retire and celebrate in Hawaii. 2. Know why you are doing it, and know if it’s worth it. As a rule, work is not a cake-walk. Just think of how much time and energy you give to your career. If the work is not satisfying in some way, you are bound to become unhappy and might miss out on the best parts of life. Consider each client or project. Are you doing it for a good reason? If the money is great, it can be worth it even if you don’t really enjoy the time spent. It’s okay to “do it for the money” as long as you recognize that, and can stop if the downsides begin to outweigh the paychecks and security. If the money isn’t great, but the contacts or recognition will lead to things you want, consider it an investment in your career. That’s worth a lot! And if the money stinks and there is really nothing to gain, but you just love the people and the energy around the project, well, that may be the most valuable job to do! So, check yourself on this: Do all your clients and/or projects fulfill something for you? You give a lot of yourself to your work, so if there are things you are doing that are not worth it, replace them with things that are! My dad is a true salesman. Not in an obnoxious, just-get-him-to-leave way. During his career, my dad was a master at listening, talking, and getting to the root of what each customer needed. And if he didn’t sell what they needed, he’d find them someone who did and make the connection before moving on. If nobody made what the customer needed, he’d invent it, manufacture it, and call them back to offer it. 3. There is no such thing as a small (or big) customer. They are all customers, but more importantly, they are all people. I used to hang out after 5pm, listening to my dad on the phone. I learned so much just listening to him talk and watching him listen. He gave just as much time, interest, energy and care to a school teacher with a $200 budget as he did a corporate event producer with a $1,000,000 budget. For that teacher, his high school play was just as important as Disney’s next movie launch. Maybe more so. Treat every person you speak with, sell to, and provide service for with equally great care and attention. My dad told me that every teacher had dozens of students and every one of those students was a potential friend, customer, future game changer of the world. Everyone has equal value. There is no measure of value because everyone is equally valuable and has equally unlimited potential as a customer—and as a friend. It’s important not to be greedy with your time and attention. Give it freely. Live Grey is dedicated to making work more human. By deepening team connection we strengthen performance, fulfillment, and culture. Grey Matters is your source for articles, insights, and advice from business and culture thought leaders.